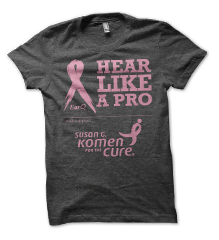 In order to celebrate the incredible work of the�Susan G. Komen Foundation�and to do our part to help promote breast cancer awareness this October, EarQ decided to make a statement; a fashion statement, that is. We took to our Twitter and Facebook pages to help spread the word. To see our staff pictures,�click here. Our membership got involved as well by purchasing shirts for their staff and loved ones to wear on their own Pink Fridays in their communities! In addition to the personal donations from our staff, EarQ donated proceeds from the t-shirt sales to the foundation.